Chris Curtis has more than 15 years of experience guiding the strategy, growth and evolution of Schneider Electric. 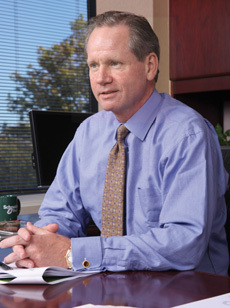 In 2008, Curtis was named president and CEO of the North American Operating Division, assuming responsibility for all operations in the United States, Canada and Mexico. He also joined Schneider Electric’s Executive Committee and assumed leadership of the Buildings and Renewable Energy activities across the globe. Curtis sits on the Board of Governors for the National Electrical Manufacturers Association and the Metro Chicago Board of Directors for the American Heart Association Midwest Affiliate. He has a bachelor’s degree from LeMoyne University and resides in the Chicago area. Curtis: Safety leadership means we’re doing everything possible to ensure our people come to work and leave work without injury. It’s a leadership imperative, in my opinion – to continually show our people, in our words and actions, that their safety is our No. 1 priority. It means putting safety first in everything we do. Our people know if we cannot complete the job safely, then we will not do the job. We are very clear that we will never conduct business in a manner that would put our employees at risk. Curtis: First, safety is at the heart of what we do as a business. We help companies and individuals make their energy safe, reliable, efficient, productive and green. It’s our business to make safe products, and we also need to make, sell and service these products safely. We’ve always had a very good safety record, but for us, the breakthrough came in 2003. That year, our new president, my predecessor, set a goal of zero injuries. Today, I am proud to say our safety culture is stronger than ever, and safety is part of our DNA. From an unwavering focus on accident prevention to extending our message of safety beyond the workplace, keeping our employees and their families safe and healthy at work and home has become definitive of our culture. It really comes down to a responsibility and obligation to our people. Compared to our starting point, we are avoiding more than 500 injuries every year. That’s 500 more people going home safely to their families at night than when we started this journey. Curtis: Creating a safety culture requires continual communication and reinforcement at every level of the organization. Every communication we do, from all-employee meetings to our daily production supervisor meetings on the factory floor, starts with a message on safety – how we’re doing, how important it is, and everyone’s role in creating and maintaining a safer workplace. For example, several times a year we do a satellite broadcast with all employees to let them know how we’re doing, what our priorities are and to answer their questions. We always start these broadcasts with our safety performance. During our last broadcast, I brought up one of our employees from the audience – she didn’t know I was doing this, by the way – to make the point that when it comes to safety, this person has as much authority on the topic as I do. She can point out a safety issue, stop a production line or do whatever is necessary to ensure employee safety. That’s the mindset we want and continually reinforce. We also walk the talk every day. Our people realize there is never a question of investment when it comes to safety or who’s in charge. And that they have a personal responsibility to help create a safe work environment for themselves and the people they work with. S+H: What is the biggest obstacle to safety in the workplace, and how do you work to overcome it? Curtis: No doubt it’s complacency. We need to assume an accident can occur at any moment. When one does, we need to quickly understand why and put the right procedures in place to ensure it doesn’t happen again. We have mandatory safety training every year for our employees. We also do yearly onsite safety assessments at all our facilities, and spot site assessments regularly. But the best thing we can do is ensure our 25,000 people in North America are our safety eyes and ears. They’ve done a fabulous job of letting us know where things can be improved. Conditions change, plants and offices change, people change. It’s an ongoing effort. S+H: How do you measure safety? What are the leading indicators that show you how safe you are, and where do you see room for improvement? Curtis: We measure our safety performance by tracking cases that require medical attention beyond first aid. We call it our Medical Incident Rate, and it’s very similar to the OSHA recordable rate used in the United States. In addition, we track lost-time accidents, lost-time days and our safety training hours per employee. We’re very proud of the fact that we’ve seen more than 75 percent improvements in all these measurements since 2003. Our employees also tell us in quarterly surveys that they appreciate our commitment, and it makes them proud to work at Schneider Electric. Most importantly, though, this means 500 fewer injuries per year. That’s what it’s all about. Every accident is preventable, every injury is preventable. There is always room for improvement. S+H: How important is off-the-job safety to your company’s overall safety program? What types of off-the-job safety programs does your company offer to employees? Curtis: It’s very important. We recognize that habits have to be developed and reinforced 24/7, whether it’s at work, home or play. The training programs we have give our people skills, insights and information on doing any task safely. We’ve expanded our program over the years to include more off-the-job training. A good example is our SafeStart program, which focuses on how things like rushing, stress, fatigue and complacency lead to increased risks of injury, no matter where you are. This also includes good family practices like safety belt usage and no cell phone usage while driving. Curtis: It’s really not about the dollars; it’s about people. Knowing that more than 500 people each year are safer than when we started is a great payment. It shows our employees and their families that we care; and when we say one injury is too many, we mean it. You can’t put a price tag on that. The National Safety Council will present its 2011 Green Cross for Safety Medal to Chris Curtis, CEO in North America of Schneider Electric, on April 14 in Chicago. Undeniably, our safety improvements also have been good for the bottom line. Our improved safety performance has generated more than $10 million a year in direct savings to our company. We call this our safety dividend. We use it to reinvest in our people through programs like free health assessments, personal fitness subsidies, onsite fitness centers, “green” teams and other programs that encourage our people to be safe, healthy and community-minded. S+H: What advice would you have for other CEOs who want to “get it”? Curtis: Make it personal. It starts at the top and you have to be personally committed. You need to set the standard, take responsibility on a day-to-day basis and ensure your leadership team models these behaviors as well. Make it visible. Set goals and communicate regularly on your progress. Recognize and reward success. Just like other investments, safety, health and environmental performance must be measured, reported, evaluated and continuously improved. It should be part of your company’s regular review process. Most importantly, it comes down to people and our obligation to them as leaders. We’re successful because safety isn’t just a program, it’s a way of life for us. I know our safety obsession has saved lives.